Pokémon has been a worldwide phenomenon for over 20 years, and yet somehow, there's never been a live-action movie based in Nintendo's world of pocket monsters – until now! Warner Bros. has released the first trailer for its upcoming film Pokémon: Detective Pikachu, starring Justice Smith (The Get Down), Ken Watanabe (The Last Samurai) and Ryan Reynolds (Deadpool) as the voice of the titular mouse sleuth. Pikachu's Sherlock Holmes-inspired alter-ego made his debut in the 2016 Nintendo 3DS game Detective Pikachu, instantly becoming a fan favorite. A movie adaptation of the video game was announced very shortly after its release. Blending live-action actors and settings with CGI animated creatures, Pokémon: Detective Pikachu seemingly follows the plot of the game quite closely, with a young man named Tim Goodman (Smith) teaming up with Detective Pikachu to solve a mystery – the twist is that Goodman can actually understand Pikachu, where everyone else only hears "Pika Pika!" 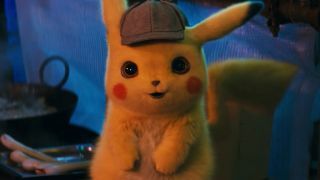 Based on the trailer below, the voice casting of Reynolds as Detective Pikachu seems like an inspired and hilarious choice that's sure to bring the family-friendly laughs when the film hits theaters on May 11, 2019.